For quite some time now, I've been collecting various editions of books by Frederick Douglass and Octavia Butler. 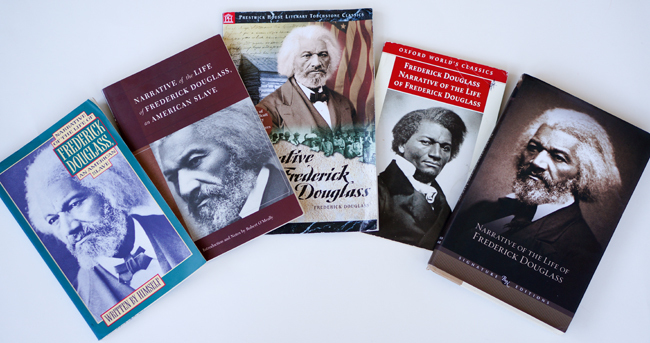 My efforts to share special collections with my students and make them aware of African American Book History led me to organize exhibits on Douglass and Butler, as well as digital projects featuring their works. Recently, for the African American Literatures and Cultures Institute, I organized photographs of Douglass and Butler books I own, along with some images of Butler books I collected online, and organized them into folders on tablets. Students can then scroll through the dozens of images -- the digital collections -- to get a sense of what all the books look like together. The book covers are fascinating for different reasons. What happens when Book History, African American literary studies, and digital humanities meet? The presentation of these collections of Douglass and Butler books on tablets provide some answers.